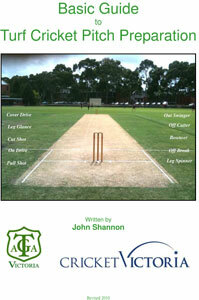 This book was written By John Shannon (Turf Management teacher NMIT and former Premier cricket player) and is a good basic guide to turf pitch preparation. In 1986, John Shannon was employed by the City of Camberwell (now Boroondara) and prepared pitches at local and sub district level. He also worked on pitches in England, and on golf courses in Melbourne and Scotland. I’m a landscape architect looking for information on design and management of natural turf sports surfaces. I’ve tried to download the pdf file of the Basic guide to turf cricket pitch preparation but the link doesn’t seem to work. Can you please send me a copy or send a link to a page where I can download it.